In the spirit of Verry Merry May, this will be a simple entry, the crux of which is to bring some discussion about how the mind of a child operates. And not just any child, but the child who was you. You know, when you were a child. I highly doubt I’m the only one who had a special toy or two. Did you have a toy that you simply could not part with when you were a kid? That toy which, looking back at it now, may seem silly, but regardless held your love and your interest captive without effort? If so, what was it? If not, what the heck is wrong with you?!? I’m talking young kid here, not ten or twelve, but like… six, or three, or something. OK, I’ll start. First, a tragedy. There was a toy (whose name I cannot recall! Help? ), and it came out sometime around 1985 or 1986, I think. It was like an Etch-a-Sketch in that it was hand-held and somewhat flat, but the drawings were done pixel-by-pixel, and the idea was that you would create “frames” and then make very pixelated, short little animations with it. They showed an animation of a cheetah running, and a boy hitting a baseball, and possibly some other stuff. And I wanted one so badly for Christmas or my birthday or one of those other days when kids all around the world suddenly deserve toys. Well… I didn’t get one. Never did. And I still remember that to this day. Cry a tear for me, I’m scarred for life. Watch out Greg Boyd, your red airplane has nothing on me. Of course I did have some toys that I loved that I still remember. We had this old wooden toy box with an ugly green plaid rough-feeling cover on it, and I had all my treasures in there. 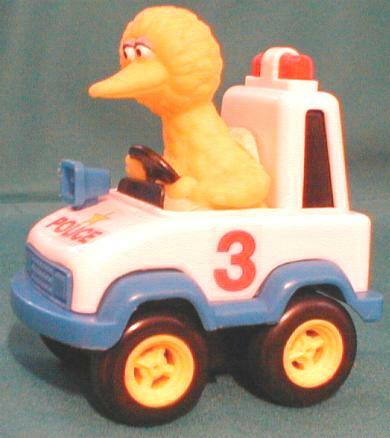 Little Sesame Street cars, somewhat like this one that had Ernie and Bert and Cookie Monster and Big Bird in them, and you could roll them around and fill in the blanks with your imagination. We’ve still got those around somewhere. There was some kind of jack-in-the-box that I loved. But it wasn’t a regular jack-in-the-box (although we had/have one of those). It was smaller, and I don’t remember what it looked like. (We’re going way back into the subconscious here, people.) But you could push a button and something would open up and pop out. I don’t know. G.I. Joes with parachutes were cool. You could throw them way up and watch them float down. Model rockets (with dad’s help, of course) were a blast. I remember the little cardboard fuel tubes that came with the little wire thingies you’d stick in the end and wire back to the ignition button. I remember how the used ones would smell. The Intellivision was another favorite of course. Got me started as a gamer, followed somewhat closely by the Commodore 64. I’ve been playing video games since I was three or four years old. Oh… this oughta damage me if nothing else does: I also liked Rainbow Brite for a period of a month or two when I was six and in the hospital on bedrest with an injured eye that was bleeding internally. I insisted that I be allowed to buy one of the dolls, and my parents were like, “Are you sure you want one of these dolls, hon?” And I was. So I got one. Then a couple months later I was like, “What the heck am I doing?” and I got rid of it. I have no idea where it came from. Alright. None of you can have anything worse than that. Time to share. Out with it! I demand that you reminisce! It better be fondly! FONDLY! I too, wanted one of those whatever they were animation doo-dads. And I have no idea what they were called either. I had this plush lamb, aptly named “Lamby”, that I dragged around everywhere until my mom confiscated it and replaced it with something else which must not have meant much since I don’t remember what it was. I wasn’t allowed to own GI Joes, or Ninja Turtles, or He-Man, or transformers, or really anything I wanted to have. My mom was a special kind of fundy mom that somehow somewhere along the line figured that male gender targeted toys were inherently evil, so I was stuck with playing with gender neutral or my sisters’ girly toys. I’ve played with Barbies. More than I’m willing to admit. At some point in my later teens I decided that I should fix my sad toy past and began spending too much time and money in the toys section of target. I bought nerf guns and hotwheels like I needed them to prove my manhood or something. So now I’ve got a box full of foam darts and nerf guns that aren’t quite as old as they should be. Oh well. Maybe I’ll have a nephew that’ll enjoy them. You know, I never considered the mild psychological damage toys could cause by either their presence or their absence (although I eluded to it in my entry). This is interesting. Does everyone have a sad/strange toy history? Or is it only just boys? It was the Etch-a-sketch Animator. I used to play with one. In fact I still have it and it still works. It is at my cabin now though so if you came to visit I probably wouldn’t have it on hand. My favorites were either GI-Joes that I played with my older brother or some of my construction sandbox toys. Being from a construction family my brothers and I had a pretty good size area of sand to work with so we always made elaborate road systems with our mini dozers, dump trucks, and compactors. About a sad/strange toy history. Maybe unique is the more accurate word to describe people’s toy history than sad/strange. Being that the toy options are seemingly endless most everyone probably had a favorite toy or two that contributed to their history that no one they know had. You’re totally right about the Etch-a-Sketch Animator Jeff! Thanks for finding that for me! See… now I’m going to have to find one on eBay just to try it out and live those moments of my childhood that I never had. Of course, some people might tell me I should be glad I never had one. Then others would say they’re still fun to play with. I, too, was not allowed the HeMans, Transformers, and GI Joes that littered the floors of my neighboors. Smurfs were also banned, but before the ban I received a Smurf guitar which features prominently in many childhood pictures. I held to it all the more strongly, I believe, since my mother once (or more) tried to take it away. I did receive for Christmas from my Great Aunt Shirley (sister: LaVerne, both from Milwaukee, I kid you not) a cool half mountain and army guys that made for great sieges. I also remember a green glow worm that may have belonged to my brother, but stands out in memory. And there was my neighbor’s Nintendo with Ninja Turtles and the original Mario. I have fewer attachments to objects, though, than I do to the games we played. Ball Tag at my neighbor’s house, with the big tree in back as goal (prounounced: goo ul). Floor hockey in the living room. The very best was a game we made up called Mad Dog, in which we would try to cross the room (usually my neighbor’s basement) without one of the mad dogs touching us (they had to keep on all fours). All the better for the MC Hammer and Weird Al Yankovic playing on the turntable, and it being outlawed at my neighbors’ house. One of the earliest objects/playthings with which you bonded was a jungle-jim in northern Arkansas. It was Spring 1979. We stopped in a roadside park for a snack during one of our family trips in our 1961 yellow VW Bus. You and Emily played in the park. She was almost four and used the swings. You were still little enough to be in a walker. You sidled up to the jungle gym and just giggled, hanging on to it for dear life…kind of the same reaction you had when you grabbed on to Steph’s hand at your wedding. We had to pry your stubby little fingers off it to get back into the hippie van and head on down the road. You wept for an hour afterward. So just what are you manipulating our Lord to do to us in YOUR prayers because of that parental cruelty? Well, my dad gets the award for most-involved. Check out the picture he just sent me. Those are the very ones. Not that anyone ELSE cares, but it’s funny to have them “documented” now. I remember I saved up for a long time to purchase the Teenage Mutant Nija Turtle Wagon. I think it cost $20! And then I got it and play with it very rarely. The toys did do something for me. I usually would set them up at the beginning of some big adventure, then I’d end up sitting and staring at them. The adventure always then played out in my head, because I’d get bored with the limitations of the toys. Also, having the toys with cool weapons made me want to find sticks and disgarded sharp metal objects with which to create my own weapons. I loved imagining myself as some superhero (Michelangelo, Snake-Eyes, Mad Max, The Man in Black) the best. I guess if I think further back I did have a Minny Mouse that I had a crush on and would kiss under my bed. And I had one of those springy horses that I rode until I was way too big for it. Yet still, I think some of the best toys I ever had were sticks and garbage. schdav, I find it quite interesting that your mom wouldn’t allow you to play with the “manly” toys, but let your sister play with freaky-anorexic Barbie. That scares me. I’ve seen lots of parents strictly monitor the boy toys, but allow just about anything that is typical girl. I think my best “toys” were animals. I spent most of my time with my Shetland Pony, Belle, from a very young age (maybe 2 or 3?). We also always had some kind of cats, birds, etc. around to play with. I had the job of “making the kittens nice.” I had a Rainbow Brite doll as well. I was really pumped to get a My Child doll. Parents were supposed to get one that looked like their kid so the doll would seem like it was their child. So, I had a blonde haired, blue eyed doll that I carried around everywhere as though she was real. I remember fighting with my parents because they wouldn’t let me set a place for her at the dinner table. That really upset me. Don’t worry though, I’m pretty sure I’m over the bitterness from that whole ordeal. I think…. I have a question: those of you whose parents limited your toys (& I’m assuming your T.V. viewing options as well), do you feel that this was actually beneficial to you in the long run? Speaking of transformers, Spielberg is directing a new movie on the Transformers for release in 2006.